I headed west on Sunday for brunch to meet some friends that had recently moved to Melbourne. We settled on Dad and Dave’s, a cute café amongst cute cafés in Yarraville. I’m always amused by the trendiness of Yarraville. Having grown up in the west, nobody would have been caught dead there when I was a kid. But it is lovely, with beautiful houses and a nice village feel. It always was, but it suffered from being in the not very desirable western suburbs. Things have changed. While not a vegan café, Dad and Dave’s has had some good reports on vegan social media. The café itself is cosy with a cute homey feel. The display cases are full of good looking cakes and other treats, some of them vegan. There are four vegan or veganisable options on menu for breakfast. 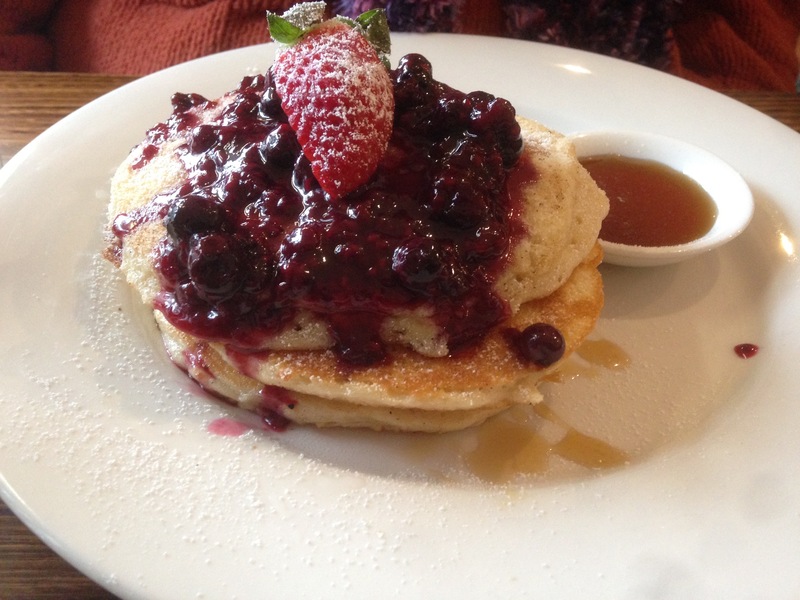 We ate two of them, the corn fritters with avocado and a beetroot chutney and the berry pancakes with maple syrup. Both were very good. The service was friendly, the serves generous and the coffee great. nice! I’ve had this on the radar too but I’m never really around Yarraville. Yep, it’s definitely changed a lot since we were kids! I wish Sunshine would get more places with vegan options.